This is a list of close election results at national and state level. The 2015 cash-for-votes scam was a political scandal, the second scandal of its kind since the 2008 cash-for-votes scandal. The 2015 political scandal started off when the Telugu Desam Party Leaders of Telangana state were caught in a video footage, aired in the media, offering bribes to a nominated MLA for his vote in the 2015 elections of the Telangana Legislative Council. The Telugu Desam MLA Revanth Reddy was arrested by the Telangana Police when he was offering Rs. 50 lakhs to the nominated MLA Elvis Stephenson. Reddy was then presented before the court of justice and sent to jail. Similarly, the phone conversation, which was quoted as the voice of N. Chandrababu Naidu, the Andhra Pradesh Chief Minister, with the same nominated MLA was aired in the news media. A fixed-term election is an election that occurs on a set date, and cannot be changed by a majority of incumbent politicians. Boundary delimitation (or simply delimitation) is the drawing of boundaries, particularly of electoral precincts, states, counties or other municipalities. In the context of elections, it can be called redistribution and is used to prevent unbalance of population across districts. In the United States, it is called redistricting. Unbalanced or discriminatory delimitation is called "gerrymandering." Though there are no internationally agreed processes that guarantee fair delimitation, several organizations, such as the Commonwealth Secretariat, the European Union and the International Foundation for Electoral Systems have proposed guidelines for effective delimitation. A midterm election refers to a type of election where the people can elect their representatives and other subnational officeholders (e.g. governor, members of local council) in the middle of the term of the executive. This is usually used to describe elections to a governmental body (generally a legislature) that are staggered so that the number of offices of that body would not be up for election at the same time. Only a fraction of a body's seats are up for election while others are not until the terms of the next set of members are to expire. The legislators may have the same or longer fixed term of office as the executive, which facilitates an election mid-term of the tenure of the higher office. ... that in order to increase his name recognition, Lawton Chiles walked 1,003 miles (1,614 km) across Florida for his United States Senate campaign in 1970? ... that the 1991 mayoral election in West Palm Beach was the city's first direct election for mayor since 1919? 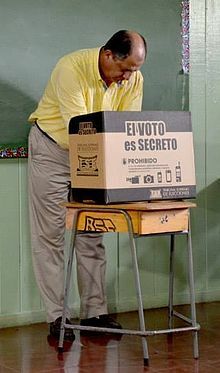 ... that Cuitláhuac García Jiménez lost the 2016 Veracruz gubernatorial election to Miguel Ángel Yunes Linares, but defeated Linares' son in 2018? ... that U.S. Representative-elect Ted Budd won his first election with 20% of the vote in a 17-candidate field? ... that in the Eutaw riot in Alabama, several black citizens were killed by the Ku Klux Klan during a campaign of terror that led to the election of Democratic governor Robert B. Lindsay? ... that Jorge Ramos Hernández became Municipal President of Tijuana in 2007, three years after losing the election to Jorge Hank Rhon? Do you have a question about Elections that you can't find the answer to? For editor resources and to collaborate with other editors on improving Wikipedia's Elections-related articles, see WikiProject Elections. This page was last edited on 24 February 2019, at 22:30 (UTC).